“The way you look at the world”, a friend told me a while ago, “will not be the same after this book.” “We’ll just see,“ I thought to myself. 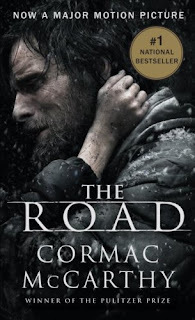 I love Cormac McCarthy anyway, always have. For me, he counts among the great American contemporary novelists. No Country for Old Men was brilliant, but in my opinion The Road is his masterpiece. I cannot promise you that you won’t have to go for a couple of days without being able to smile after The Road, and I can most definitely not promise you that you won't have to shed the odd tear while reading it. It’s a heart-breaker, a gut-wrencher, a soul-inside-out-turner. It’s so god forsakenly sad … dammit … it’s post-apocalyptic emptiness, and it’s not, like other critics maintain, ultimately a story of hope … but then, McCarthy never is. I give The Road 5 out of 5 smileys and I envy you – I sincerely envy you – for being able to read it for the first time. Enjoy. And remember my words. The way you look at the world will not be the same after this book.